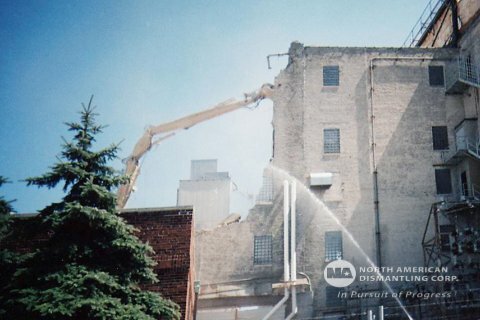 Froedert Malt Plant | North American Dismantling Corp.
North American Dismantling was contracted by the Miller Park Way Limited Partnership to provide environmental remediation and dismantle the Old Froedert Malt Plant in Milwaukee, Wisconsin. 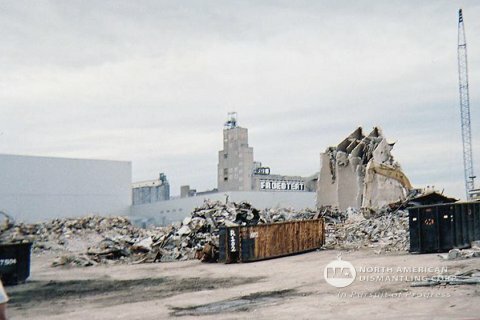 The plant consisted of 33 structures on a 11 acre site. The plant was originally constructed in 1910 with several additions occurring in 1913, 1925, 1928, 1934, 1939, 1940, 1941, 1942, 1943, 1946, 1953, 1956, 1960 1978. This project consisted of 3 major sections of work; The concrete silos and the Malt Plant Proper and Out Buildings with Site Work. The silo area consists of 5 major groups of silos known as Grain Tank Groups A, B, C, D & E comprised of 69 separate silos, 2 Grain Elevators totaling 60,000 Square feet. The silos and elevators range from 100′-0″ to 120′-0″ in height. The silos and elevators are of concrete construction. The main building is comprised of several major buildings that have been connected over the years totaling 240,000 SF. The building consisted of Storage Houses A, D, and E, Boiler House, Engine House, Locker Building, Kiln Houses A, B, C & D, Production Lab, Office Building, Research Lab, Germinating Houses A, B & C and miscellaneous structures The main building is constructed of masonry walls, concrete and structural steel framing, and concrete and steel roof decks and built up roofing. In addition to the main building there exists several out buildings totaling 20,000 SF. The building were the Meter House, Vaporizing House, Maintenance Building, Pump House, Auto House, Rail Car Unloading House The outbuildings are a combination of steel framed, masonry block and steel siding construction. 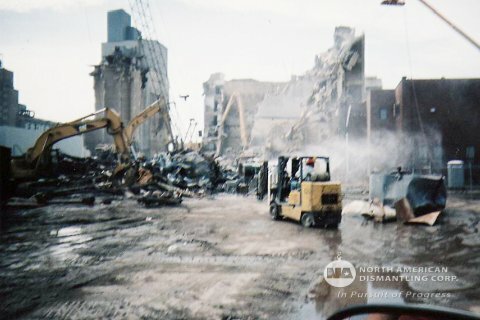 In addition to the demolition, North American Dismantling was responsible for the complete environmental clean up of the plant including asbestos, CFC’s, Lead Based Paints, Hydraulic Oils, Fluorescent Light Bulbs and Ballasts, PCBs, etc. 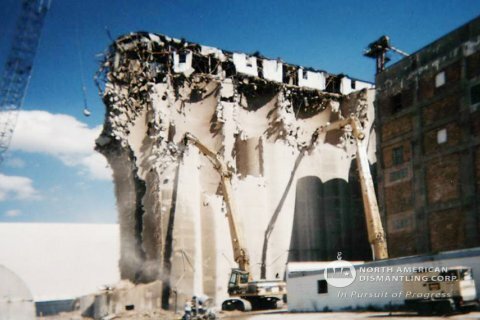 North American Dismantling designed a specialized water blasting operations to remove asbestos coatings from the sides of the silos to 100’-0” in the air. 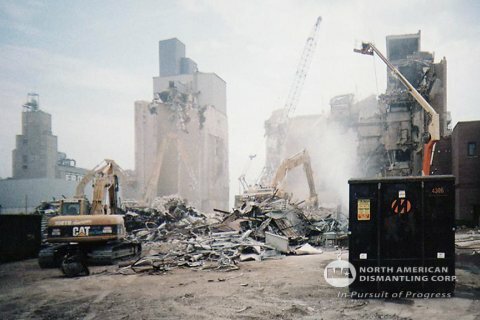 The asbestos was removed by water blasting methods while simultaneously being vacuumed back into a enclosed system for disposal. 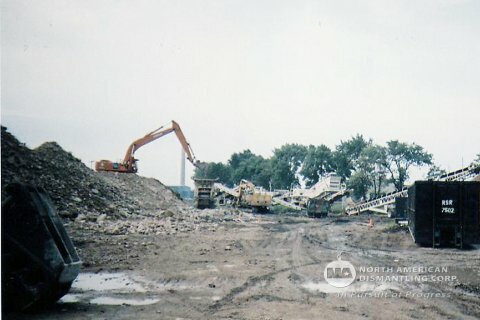 At the end of the project North American Dismantling recycled and processed approximately 80,000 tons of concrete to 21AA specifications. 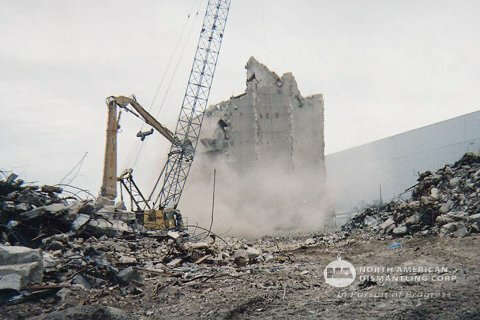 environmental remediation and dismantling project.